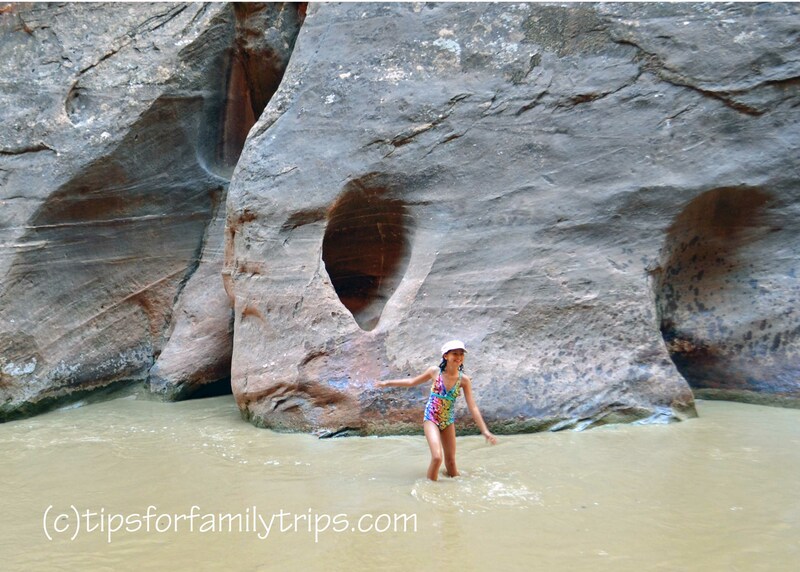 The Zion Narrows is an increasingly popular hike for families in Zion National Park, and for good reason. This walk through the Virgin River Gorge lets visitors see some of the most beautiful parts of the park – dramatic cliffs, hanging gardens and gorgeous colors. It is also a great hike during the summer months when temperatures in Zion often soar above 100 degrees (F). Hiking in the river is comfortable and fun when it is hot outside. My children (ages 6 and 9) loved playing in the water along the way. However, successfully hiking the Zion Narrows requires preparation. Flash floods, hypothermia and foot injuries are real dangers on this hike. It is important to know what to expect before wandering in very far – especially with children. Late June through early September will be the easiest time to hike The Narrows with children. The temperatures will be at their warmest and the water levels should be safer after the spring runoff subsides. Choose a clear day with little danger of rain. Flash floods can occur with little warning, and hikers have been killed by floods. Check with the Ranger Desk at the Visitor Center before you go to get updated information about conditions on the hike. You can hike the Narrows at other times of year, including winter. You’ll need to contact a local outfitter to rent the right gear, and perhaps go with a guide. You’ll be rewarded with smaller crowds. Squirrels are abundant on the Riverwalk trail. They are really cute, and unafraid of visitors, but please don’t feed or touch them. Take the Zion Canyon shuttle to the last stop, Temple of Sinewava. Hike the 1-mile Riverwalk trail to its end. The Narrows begins at the end of the Riverwalk trail. The river is the trail. You won’t have to spend all your time in the water, but walking in the river some of the time is unavoidable. Walk into the river and hike as far as you like, then turn around and come back. It is possible to hike the entire 16 miles of The Narrows with a permit, starting at Chamberlain’s Ranch and finishing at the Riverwalk trail. However, the scenery at the bottom is spectacular, and I have never been disappointed by hiking just 1-2 miles in and out. If you hope to get into The Narrows before lunch time, arrive at Zion National Park before 9:00 a.m. The parking lot at the Visitor Center will likely be full before 10:00 a.m. It can be a hassle to find parking outside the park, unless you stay in Springdale and ride the town shuttle in. The shuttle ride from the Visitor Center to the Temple of Sinewava will take about 45 minutes. The Riverwalk hike will take another 20-30 minutes with children. With stops at the Ranger desk and the bathroom, it can take up to two hours just to start hiking the Zion Narrows. From the Zion National Park website, “hiking The Narrows is like walking on slippery bowling balls.” I saw several people hiking over the algae covered rocks in the Zion Narrows barefoot, and I’d be amazed if they came out with their toes and ankles intact. My preferred shoes in The Narrows are hiking boots with good ankle support and socks. However, I and my children have hiked short distances into The Narrows in sport sandals like Tevas or Chacos with good success. The sandals offer less protection, but they will not fill with mud and water, and will dry quickly after the hike. An old pair of athletic shoes is also a good choice. I dressed my children in their swimsuits, and my husband and I wore shorts and t-shirts. It was at least 100 degrees (F) on the late July day that we were there, and the water was refreshing, especially as the shade in the canyon gave way to the afternoon sun. Bring hats and sunglasses too. A walking stick can greatly help your stability when walking in the river. If you arrive early (or late), you may find a collection of natural walking sticks at the bottom of the Riverwalk to borrow from. I saw other hikers use trail poles, PVC pipes, mop handles, and wooden hiking sticks purchased from the Visitor Center. Beware of both hypothermia and heat exhaustion. You may wish to pack layers and avoid cotton clothing, which offers no insulation. If you have any concerns about your gear, local outfitters rent sturdy waterproof boots, wet suits and walking sticks. Bring at least one day pack into The Narrows with the supplies your family will need for the hike. The most important things to pack are plenty of drinking water and high-energy food for each person. Sunscreen is also an essential item. In late July, the river didn’t rise past my knees, so keeping the packs dry wasn’t much of a problem. However, even experienced hikers can fall on the slippery river bed, so waterproof your pack by lining it with a plastic trash bag, or sealing everything in Ziploc bags. Other items you may wish to bring include anti-bacterial gel and first-aid supplies. There are no trash cans in The Narrows. Plan to carry out everything you carry in. There are no bathrooms in the Zion Narrows, and on the day we were there, it was so crowded that there was not a private shrub to duck behind. Make sure everyone in your family uses the bathrooms at the Visitor Center or Temple of Sinewava shuttle stop, or both, before you begin the hike. Unless you are hiking the entire Zion Narrows with a permit, this is a trail with no particular destination or view point that you have to see. It’s all beautiful. So, don’t feel pressure to cover a lot of ground before you turn around and come back. Our goal was to reach the Orderville Canyon junction with our children, a slow two-hour hike into the canyon. In the end, I doubt we hiked half that distance. My daughter loved finding shallow swimming holes and my son liked playing in the sand. We finally landed in a shady spot next to a huge boulder that was easy to climb and my children played there for at least half an hour before we turned around and played our way back. My six-year-old son hated the first half of our Narrows hike. He complained that the water was cold and he felt insecure in the river. He was anxious about the unknown challenges ahead. When we decided to stop and play by the boulder, he was determined to remain unhappy for a few minutes, but then could not resist having a good time. He played in the water and challenged his grandpa (who has hiked The Narrows dozens of times) to race to the top of the big rock. We sweetened him up with granola bars, and talked about the best crossings to take on the way back. Near the end of the journey, he asked Grandpa if we could hike The Narrows again next year. That’s what I love about hiking the Zion Narrows. It’s not the destination that matters, but the memories we make along the way. Need a place to stay? Springdale is closest to Zion and has several good lodging options. St. George, Cedar City, Hurricane or Kanab also make a good base for a trip to Zion and other nearby attractions. Two places I really like are Zion Ponderosa Ranch and Resort on the east side of the park and Coral Springs Resort, just north of St. George. Click the button to check rates and availability for these and other options at TripAdvisor. What a cool place! I can’t believe all the other people that are there, too. Truly one of my favorite areas on this continent. Incredible! So excited to do this! It is one of our first stops on our 7 month long RV trip around the US. Thanks for the great info! What an exciting family adventure! Those will be priceless family memories. When I hiked this we were the only ones in the canyon. I guess that was before it was cool. Now I’m not so sure, judging by the crowds in these photos, that it would be the same peaceful experience for my children that it was for me. Zion National Park is one of the most visited national parks in the U.S. and the Narrows is a popular hike these days. You can escape most of the crowd if you are willing to hike farther in. Most hikers will turn around in the first mile or two. Don’t do this hike! It is incredibly dangerous, hot and boring. Wouldn’t recommend. Stay away. I can’t imagine ever thinking that the Zion Narrows are boring, but I will agree that this hike is not for everyone and I am glad to have your opinion. I also agree that the weather will likely be hot and that there are real risks to hiking the Narrows. Everyone who sets foot in the water should be aware of the risks and prepare for them as much as possible – especially with kids. I’m sorry – I know everyone is entitled to his or her own opinion, but really Eva? Yeah, it’s so boring that millions of people have traveled to Utah from all over the world to hike the Narrows. If you heed warnings and are smart, the Narrows is no more dangerous than any other hike in a National Park. There are inherent risks, yes. The rocks can be slippery and unstable – but you don’t hike the Narrows to make good time, you hike it to have a good time. I hiked about the first 2-3 miles of it with my husband, and children 13 and 11 this summer. We will be going back another time, NOT in summer, so hopefully it won’d be so crowded. This hike is NOT incredibly dangerous, it’s fine if you aren’t stupid. It’s not too hot if you aren’t stupid, and it’s not boring if you aren’t stupid. If you check with the Ranger Station for flash flood warnings and are given the all clear, go for it. If you feel this hike is too dangerous or are terrified of it, please stay home. Those of us that are hiking it would greatly appreciate it! (FYI – we hiked 95 miles on our 30 family RV trip all over the western US. – 20 states, 14 National Parks, and a few monuments and memorials too. Zion and the Narrows was our favorite place with Mesa Verde NP a close second. You can keep Yosemite and Yellowstone, we’ll take Zion!) If Eva thinks that the Narrows is “incredibly dangerous” please don’t let her do the Balcony House tour at Mesa Verde! We did Zion this August and I poured over your website in advance and can’t thank you enough for how it helped me prepare. I am 49 and my husband is 52 and we have a 10 and 4 yr old. We are not outdoorsy/hiking people, although we’re all active and in great shape. I would put our day in the Narrows as our BEST day ever of vacationing so far in our parenting years. My kids absolutely loved it and I could not believe how far we went. They were fearless and loved every challenging step. I was behind them the whole way with camera in hand hoping i wouldn’t fall lest i damage my camera! I captured nearly 350 shots that day and still love looking at all of them. Our entire trip (3 1/2 days in Zion) was fantastic. Would so go again. Agree with everything you said about the hikes you recommended with kids. And my kids too played for over an hour in the stream at the bottom of Weeping Rock while I patiently waited and again shot photos. Thank you! And thank God for making Zion!! Thank you, Pam for your feedback! I’m so glad that you had a wonderful trip. I too thank God for Zion. We’re planning our 1st trip to Utah (all 5 NP plus Mesa Verde & Great Basin) at the end of May 2016. My 13y son will hike anything, anytime, anywhere…but I hate heights. The Narrows might be a good compromise. Will May end be a good time for the Narrows? May might be a little early for the Narrows because the river will be higher and colder with spring runoff. You may be able to get better information and rent good waterproof gear from a local outfitter. May will be a beautiful time to visit the park! It sounds like a great trip. Coming to Zion in late March with an 11, 7 and 4 year olds… recommendations for a fun experience with children when it isn’t quite hot out yet? I haven’t hiked the Narrows in late May/early June, but you may need more substantial clothing and shoes for that time of year. The weather should be warm, but the water may not be. It will also be deeper than later in the summer. Keens might be OK if you’re just going to walk in a little way and then back out, and you’re OK with calling it quits if it isn’t fun. If you want to be sure to have a good experience in the Narrows in late spring, I recommend calling the ranger desk or a local outfitter for gear recommendations. Great to see all needed info you shared!! Thanks for your post.Very helpful and effective post. We’re thinking of visiting Utah this May 2017 – Zion and Bryce mainly – w a 4 yr old. Too young? Is the narrows even realistic in may with a 4 yr old? As much as we are dying to go out there, should we wait a few more years till she’s older? We’d be traveling from the NY, so not a quick or inexpensive trip . Hiking the Narrows with a four-year-old in May will probably be less than ideal. The water will be higher and colder in May, and if your child is not an experienced and enthusiastic hiker, it could be a frustrating experience. I have hiked in the Narrows with children nearly that young, but later in the summer. I recommend consulting with a park ranger and a local outfitter about safety and rental gear before you commit. That said, May is a beautiful time to visit Zion and Bryce and there are many other wonderful things to see and do in those parks with preschoolers. I agree that hiking the narrows in may wits a 4yr old won’t be ideal. You could go and do the 1 mile paved river walk that leads to the narrows trailhead and go just a little ways up river, but yes, it will be much colder and deeper. We went in mid July and it was still challenging in some spots. But Imo it’s still worth going even to see a little but. The Riverwalk is easy and beautiful. Then go to emerald pools trail. Easy and beautiful, not dangerous. Have fun! Thank you, Krista! I completely agree. Jeez, sorry for the typos. Stupid phone autocorrect! No worries. I feel your pain! Hi, thank you for the great post. We are travelling to south California and Las Vegas in the beginning of June, with two kids: 8 years old and 13 years old. 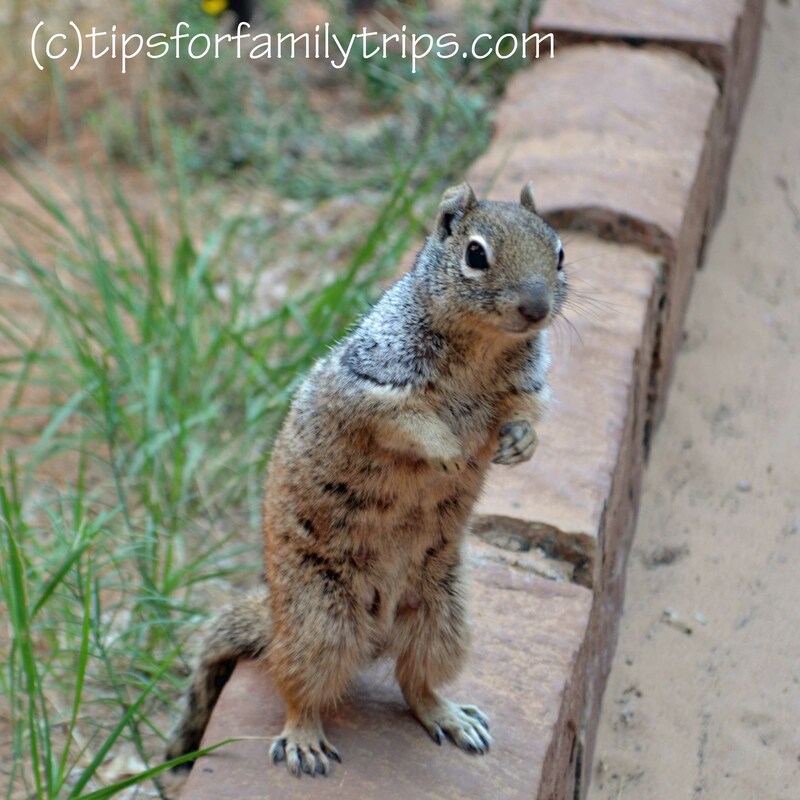 We planned two days trip from Las Vegas to Zion park on June 14 – June 15. Will it be a good time? Is it already considered Summer, or still high level cold water of Spring time? The weather should be warm enough for water play by mid June. The water may still be a little high and cold. Do consult with a ranger about your plans when you arrive.